Doorway to a building on George's Island in Boston Harbor. Terrific textures. I love the stone lintel too. Looks like it's been locked up for a while. a vintage doorway!Wonderful brick art and colours! Love the rough state of the door and the effect of the uneven brickwork. It seems rather old, and never used: the grass is growing , painting is spoiled,some bricks are broken... But the chains are new.. I wonder what's behind! 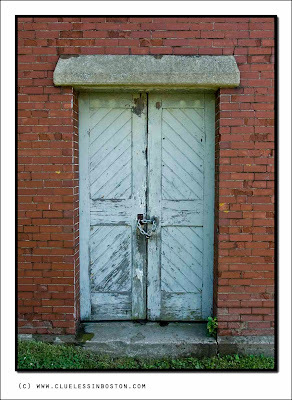 Love these old doorways with character and flair. Nice work! If they could only talk. Loads of interesting stories. It's number 10 but I'm guessing this is not Downing Street. The chain is making me wonder what is inside! A great door! Even chained! But doesn't it drive you a little nuts now knowing what's behind it? Dontcha just want to cut that chain away and reveal the unknown? This is great! I love a barn style. Nice old doorway and nice lock! What is it about faded doorways that are so intriguing. I love shots of doorways and windows. This one is great since it shows such character and age. I'm catching up on all the great photos you've added to your blog...I don't know which one I Iike best; they're all captivating! Thanks for visiting my WW. A very charming door although it is locked. Love the vintage bricks.